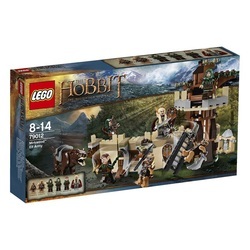 Lego toys have been a childhood favourite for years and with the release of the Lord of the Rings and Hobbit movies, these lines of toys are becoming even more popular. This set is just one of many in the series; find out how it stacks up compared to others. Most buyers were extremely pleased with this popular Lego kit. All of the figures have nicely painted details and accessories such as interchangeable helmets, hair pieces, capes, weapons and shields. The weapons and shields can also be attached to the building wall as accent pieces, which is a nice touch. The warg was a welcomed addition to the traditional Lego figures that include orcs and elves. A look out tree adorns the corner of the protective wall, adding a more realistic effect. Considering the detail, the number of pieces included and the fact that it's a high quality Lego toy, the cost of this set is very attractive. The kit contains over 275 pieces and even though the box says for ages eight and up, some parental help may be necessary. The only real downside to this toy is that the wall pieces tend to come off easily, but being Lego pieces, they can just as easily be snapped back on. Other buyers said the tree falls apart frequently and the entire wall in general is a little flimsy. The tree does have a rotating feature and the wall can shoot missiles. The stability problem can be fixed by just attaching the wall to other support walls in similar sets or adding additional Lego pieces to make the base thicker. As a general rule of thumb, almost any Lego set is a good gift. 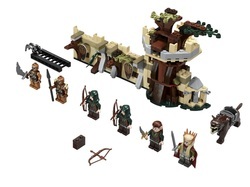 The Lego Lord of the Rings Mirkwood Elf Army Building Kit would be the perfect present as a first time Lego set or a great addition for any Lego collector ‚Äì there are plenty more Lego Lord of the Rings sets available to go with this one. For the price and detail involved, this is definitely worth buying.